Handmade Happiness : These are what I bought! 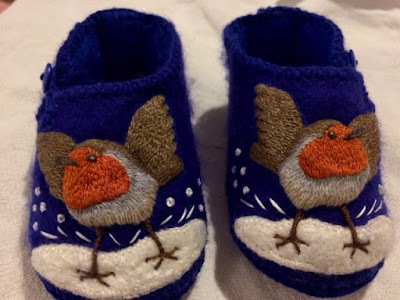 Made by Diane Higgins, I fell in love with these embroidered felt baby shoes! Diane Higgins makes felt which she then embroiders. Just occasionally I am utterly blown away by someone's talent! I call it the Wow factor. Diane Higgins works all year to produce enough of her exquisite designs for Sparkle at Teddington. Having taught textiles all her life, she now makes felt scarves, and embroidered Christmas decorations and baby shoes for this annual sale.